Ubiquitous Computing, Architecture, and the Future of Urban Space edited by Mark Shepard. On May 14 2011 we will also take part in the book launch event in Rotterdam. Here I will show that the debate about the Sentient City can be understood as a dispute concerning the urban public sphere. On the one hand, the rise of sentient technologies is said to contribute to the (already on-going) demise of urban public spaces such as town squares, multifunctional streets and public parks. On the other hand, there is a hope that those same sentient technologies could enable new forms of publicness and exchange. These are no longer based on bringing people with different backgrounds and opinions spatially together (as in cof­feehouses or town squares), but on the organization of publics around particular issues of concern. This foregrounding of the normative side of the Sentient City goes against the grain of the discourses of ‘ubiquitous comput­ing’ (or ubicomp) and ‘urban computing’ that play a dominant role in the debate on the Sentient City. In ubicomp, an appli­cation is usually thought successful if it makes the computer disappear. While we carry on our daily routines, computation technology – calmly operating in the background – will make our live more easy, efficient or exciting – whatever way we would want it. Not only does it do away with the need to interact with those beige boxes on our desktops (which of course is not a bad thing per se), it also renders invisible and presents as natural the visions of what a city should be and for whom these social interventions are enabled. 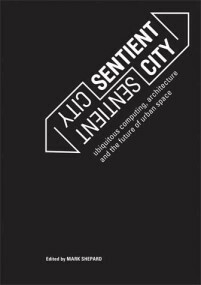 The conceptualization of the Sentient City can thus be understood as a deliberate move in the debate on the role of computers in urban society. Toward a different public sphere? Publics may also gather in a different way. One of the promises of the rise of sentient technologies is that things, objects and issues can record their own ‘biographies.’  The project Trash Track by MIT’s Senseable City Lab demonstrates this affordance. For this exhibit, trash items such as paper cups are tagged with a GPS-device and mobile phone modem. After it has been disposed of, the item sends text messages with its location, so we can follow its track from recipient to waste disposal site. The hope expressed through this project is that knowing will lead to a change in doing: the fact that we know where our trash ends up should make us more aware of the problem we create by throwing things away. It is, however, not as simple as that. A beautiful visualization of data gathered by sentient technologies might be just that – an aesthetically pleasing work of art decorating a museum wall. Bratton and Jeremijenko point out that many of such mappings do not really lead to the formation of active publics. They don’t change who is asking what kind of questions, they do not show alternatives, or give anyone a sense of agency. It makes a difference whether the information received about issues is collected by marketing agencies or institutions that are by law obliged to register and publish such data, or whether a group of local activists who have a completely different inter­est in the issue of concern has programmed the sensors and algorithms involved. In short, Bratton and Jeremijenko argue, we do not need mere mappings, we need interfaces that allow the public not just to take note of a dataset, but that also provide it with an agency to actually get involved. 1. R. Boomkens, Een Drempelwereld: Moderne Ervaring En Stedelijke Openbaarheid (Rotterdam: NAi Uitgevers, 1998). 3. Mark Shepard, “Curatorial Statement,” The Architectural League NY, http://www.sentientcity.net/exhibit/?p=3. Looking forward to the book launch and presentation event! I have been waiting for the book and your contribution is, as always, very much on point. Also, I’d like to congratulate you on the renewed aim for The Mobile City. I think you have a very relevant goal. I sure hope designers and policy makers understand the importance of your work and use your knowledge. Interesting site and valuable ideas! Yes, That’s a nice Urban Data Visualization. So what?